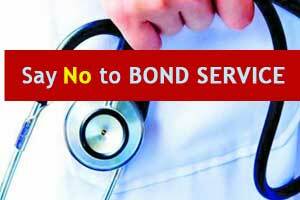 The bond system introduced by Tamil Nadu, the aspirants joining courses at a medical college have to execute a Bond for service of ten years and failure to abide by it would entail a penalty of Rs 2 crore. New Delhi: The Supreme Court today agreed to examine a Plea of doctor, aspiring for super speciality courses, challenging the service Bond conditions imposed by various states. A bench of Justices S A Bobde and L Nageswara Rao issued a notice to the Centre, the Medical Council Of India and 12 state governments on a Plea filed by the Association Of Medical Super Speciality Aspirants and others. Senior Advocate Amrendra Sharan, appearing for the doctors, said several states have introduced a Bond system at the time of admission under which an aspirant has to remain in service for 10 years and if he or she breaks the bond, they have to pay Rs 2 crore as penalty. He said the Bond system introduced by some 12 states was in contravention to the apex court’s earlier verdict which had said that only merit should be the criteria for enrolment to the super speciality courses. Sharan said in the Bond system introduced by Tamil Nadu, the aspirants joining courses at a medical college have to execute a Bond for service of ten years and failure to abide by it would entail a penalty of Rs 2 crore. He said under the Bond conditions imposed by some states, the doctors would have to serve three years in rural and difficult areas, where there are no necessary infrastructure for their practice. Terming the Bond system as discriminatory, Sharan said it went against the existing Law and the court will have to decide the issue. The bench said it would look into the matter and sought responses from Centre, Medical Council Of India and state governments. The super speciality course aspirants had claimed that due to the Bond conditions in various states, doctors have not joined the courses last year, entailing a huge loss to the public exchequer. Indian Govt. praised sundar pichai for leaving the country for better opportunities abroad. Indian Govt. targets doctors who want to practise in India. Any update on this ? Does anyone know the case number ? Or people or lawyer involved ? Why only doctor\’s are always targeted. Politicians,MLAs, Ministers etc., not allowing loksabha n vidhansabha to work.still get salary. They are not working in their area. They should sign bond regarding work bond . Highly discriminating law. Y it\’s only imposed on doctors time and again. This is a voluntary step taken to avoid students who do not belong to Tamil nadu. Anyways…..All post graduates have completed their bond after their pg. This kind of superimposing is not discipline and non Tamil doctors really can\’t stay in Tamil nadu. Same thing with all states. I personally feel If an option is given to superspeciality doctors about service…..I\’m sure they wd come up with a plan which meets both ends of service to poor and doctors personal security. Service has to done with love and passion to treat poor patients. Compulsion infers contradictory welcome and this bonded labour will make things worse. Ever since neet SS was introduced, there have been lots of problems ….and why a system which was going smooth for SS entrances was disturbed……?